Aim: This study aims to find out the proinflammatory chemokines macrophage inflammatory protein (MIP)-1α and MIP-1β levels in gingival crevicular fluid (GCF) of primary, mixed, and permanent dentitions. Materials and Methods: GCF of 160 individuals (4–15 years of age) was collected by the extracrevicular method. They were categorized into four groups (40 per each group). Group I: subjects with primary dentition (4–5 years of age), Group II: 40 subjects in early transition period (6–8 years), Group III: 40 individuals in the late transition period (9–11 years), and Group IV: 40 individuals with permanent dentition (12–15 years). MIP-lα and MIP-1β levels were determined in the samples of GCF by ELISA method. Data were analyzed by software SPSS Version 20 (IBM SPSS Statistics for Windows, IBM Corp., Armonk, NY: USA). Results: MIP-1α and MIP-1β were detected in all samples. The highest mean MIP-1α and MIP-1β concentrations in GCF were detected in the early transition period, while the lowest concentrations were seen in primary dentition group. 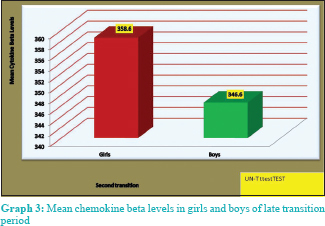 The chemokine levels were higher in girls than in boys in Group III. There was a substantial rise of MIP-1α and MIP-1β levels during eruption. Conclusions: Since levels of MIP-1α and MIP-1β in GCF are positively associated with tooth eruption, they may perhaps be deemed as novel biomarkers in the eruption process. Shapira et al. stated that gingival trauma related to active teething may cause release of inflammatory cytokines. Wise et al. established that MCP-1 was secreted by dental follicle (DF) cells to signal mononuclear monocytes to arrive at the developing DF. Here, these cells fuse resulting in osteoclasts, which resorb the alveolar bone and make a pathway for eruption. Hence, the first important event in tooth eruption is initiated by MCP-1 and other chemokines. This knowledge may help us in predicting the eruptive process and taking the necessary steps to improve the overall health of dentition. Very few studies are carried regarding chemokines, such as MCP-1, in tooth eruption of animal models. 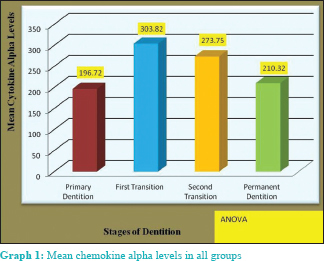 To the best of our knowledge, no study was done in humans regarding chemokines role in tooth eruption in children and adolescents.,,, Hence, we examined the inflammatory cytokines levels in GCF of primary, mixed and permanent dentition, during the eruption. We carried this prospective study on 160 healthy controls (80 boys and 80 girls; 4–15 years) who attended the CKS Theja Institute of Dental Sciences and Research, Renigunta Road, Tirupathi, Andhra Pradesh, India. The study was carried from January 1 to December 31, 2016. Randomization was achieved by computer draw method, and the sample size was determined from a similar studies using the formula: n = ([zα + β])2 with a confidence interval of 95% and power of 95% for the study. The study has registered Ethical Committee Approval (CKST/E12A/2016). Parents of all the involved children signed an informed consent and clearance was obtained from the Institutional Ethical Clearance Committee. After taking a thorough medical history, plaque index (Silness and Loe), gingival index (Loe and Silness), decay, missing and filled teeth (DMFT)/deft (<3) scores were recorded for each subject to avoid bias in the results. Children were categorized into four groups with two subgroups each. Group I; 40 individuals in primary dentition period (4–5 years of age); Group I A (20 males) and Group I B (20 females). Group II had 40 individuals in the early transition period (6–8 years of age), subdivided into Group II A (20 males) and Group II B (20 females). Group III; 40 individuals in late transition period (9–11 years), divided into Group III A (20 males) and Group III B (20 females). Group IV; 40 individuals with permanent dentition (12–15 years of age), Group IV A (20 males) and Group IV B (20 females). Healthy, cooperative controls without any radiographic confirmation of caries/periodontal infections. Patients with a history of systemic diseases (e.g., juvenile diabetes), gingival or periodontal infections, caries, receiving antibiotics, or nonsteroidal anti-inflammatory drugs 6 months before the study were excluded. Tooth polishing was performed before the start of the study. With a sterile mouth mirror and a Goldman/Fox Williams periodontal probe, the periodontal status was examined clinically. After isolating the area with cotton rolls, 1–3 μl microcapillary pipettes (Sigma Aldrich Chemical Company, USA; Catalog No. p0549) were used for GCF collection. 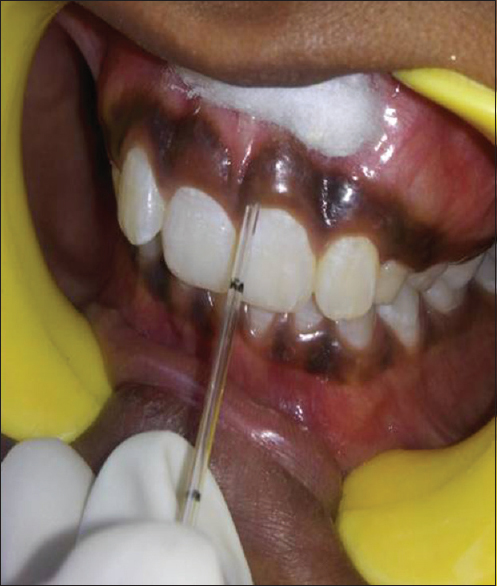 By positioning the tip of the pipette extracrevicularly (unstimulated) for 30 s, a standard volume of 3 μl GCF was collected from each test site, i.e., buccal, mesial, distal, and lingual/palatal sites of matured primary molars in primary dentition, using the graduation marks on the micropipette, as described by Ureles et al. The GCF in mixed dentition was collected from sites distal to second primary molar, and in permanent dentition distal sites of permanent first molars as mentioned by Rody et al [Figure 1]. The pipettes were transferred to the laboratory immediately and frozen at −70°C for analysis. We performed the ELISA using the quantitative sandwich enzyme immunoassay technique. A polyclonal antibody specific for MIP-1α and MIP-1 β were precoated onto a microplate. Samples were put into the wells, and any MIP-1α and MIP-1 β present was bound by the immobilized antibody. After washing, an enzyme-linked polyclonal antibody specific for MIP-1α andMIP-1β was added. Then again wash was performed, and a substrate solution was added. It resulted in the development of color as per concentration of total MIP-1α and MIP-1β [pro-and/or active: [Figure 2]]. 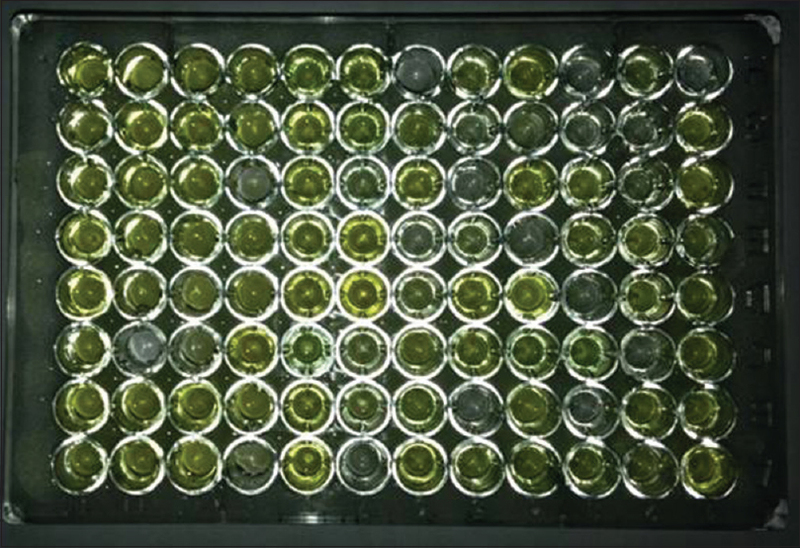 The color intensity was measured using ELISA reader. The results were averaged (mean ± standard deviation) for each parameter. Intergroup comparisons were performed using ANOVA, P < 0.05 was considered statistically significant. Statistical Package for the Social Sciences (SPSS) software, version 20.0 (IBM SPSS Statistics for Windows, IBM Corp., Armonk, NY: USA) was used for Data analysis. The clinical parameters, such as gingival index, plaque index, and DMFT/deft, recorded for all 160 individuals and analysis revealed the difference being insignificant [Table 1]. All the samples in each group showed positive for MIP-1α and MIP-1β [Graph 1] and [Graph 2]. The mean values of MIP-1α and MIP-1β were highest in Group II and least in Group I [Table 2]; P = 0.001]. Intracomparisons between the genders in each group were made by Games-Howell test, and it revealed that MIP-1α and MIP-1β values were more in girls than boys [Table 2] and [Graph 3]. The sites used for GCF collection were mesial, buccal, distal, and palatal gingival sulci of primary molars. Following the methodology of Ureles et al., a larger volume of GCF could be retrieved. In mixed dentition periods, GCF was obtained from the distal side of permanent first molar and deciduous second molar to prevent contamination, as illustrated by Rody et al., In individuals in the first transition period, GCF was also collected from mesial, distal, labial and palatal sulci of permanent incisors since they were the first teeth to erupt and with significant gingival and mucosal changes. In permanent dentition individuals, GCF was obtained only from the distal side of first molars to prevent salivary contamination, as described by Rody et al. Our results suggest that chemokines are demonstrable in GCF of primary dentition, which is similar to Wise et al., who also observed a rise in the levels of interleukin-1ß (IL-1ß), IL-8, and tumor necrosis factor (TNF) α at the time of the eruption. Group II showed maximum concentration of chemokines, which agrees with the results of Cohen and Carpenterwho stated that epidermal growth factors and other inflammatory mediators are necessary for eruption and that their administration into rodents hastened eruption in them. Wise et al. reported aberrated eruption in mice that lacked Type I receptor for IL-1α (IL-1R). Tooth eruption was delayed for 2 days for molars and 1 day for incisors, and administration of IL-1α hastened eruption by 2 days. In Group IV, the MIP-1α and MIP-1β levels were lower than that in Groups II and III. This could be due to the establishment of occlusion. Intergroup comparisons showed that low values in primary dentition could be owing to the completion of eruption process by 4 years of age. Shapira et al. also reported cytokines in GCF of erupting primary teeth. Memarpour et al. stated that the release of these cytokines, like TNF, is more likely due to systemic symptoms such as increased temperature, during teething. When there is inflammation, IL-1ß is the main endogenous pyrogen which causes tissue damage by stimulating neutral metalloproteinases release from fibroblasts and other mesenchymal cells. It also stimulates the production of many other cytokines. The maximum levels of MIP-1α and MIP-1β were seen in the early transition group and could be owing to the active phase of the eruption. This may be due to stimulation of DF cells thereby osteoblasts and osteoclasts creating a pathway of eruption pathway by release of signaling molecules such as MIP1-α and MIP1-β, into the periodontium of the surrounding mucosa through the junctional epithelium.,, According to Wise et al., MCP-1 secreted by DF cells stimulate the mononuclear cells, and this is the first significant cellular event of eruption. The intragroup comparison showed that the values of MIP-1α and MIP-1β were more in girls than boys. This could be owing to hormonal changes since estrogen alters inflammatory response by modifying chemokine expression by periodontal ligament cells. Cielinski et al. observed that the maximum influx of mononuclear cells into DF occurs by day three after eruption of mandibular molar in animal models. In turn, these cells combine and form osteoclasts which erode alveolar bone thus creating an eruption pathway. We noticed that such osteoclastic and osteoblastic activities are required for creating a pathway for eruption. Group IV exhibited lesser peak values than Groups II and III. This is similar to Kamma et al., who reported that levels of cytokines decreased from adolescents to adults. However, they could not explicate the reason for such variations in adults and adolescents. MIP-1α and MIP-1 β values were more in girls than boys. Unknown systemic factors (teething accompanying systemic disturbances) which might affect the chemokines levels were not considered. Since eruption is an intricate process involving many molecules/gene factors for creating an eruption pathway, future research should include long-term studies exploring the effects of other molecules necessary for the eruption. Assessing markers such as chemokines MIP-1α and MIP-1β can aid in predicting eruption disturbances, thereby preventing malocclusion and other related phenomenon. We found that the chemokines MIP-1α and MIP-1β were detected in all primary, mixed and permanent dentitions. Their levels were elevated during the active phases of eruption (i.e., first transition period). 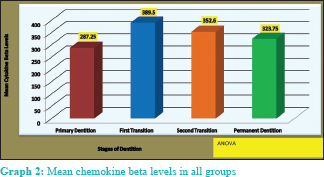 Hence, determining the role of chemokines will require comprehensive studies performed on several pathological conditions related to primary failures in tooth eruption. Kumar NK, Reddy VK, Padakandla P, Togaru H, Kalagatla S, Reddy VC, et al. Evaluation of chemokines in gingival crevicular fluid in children with band and loop space maintainers: A clinico-biochemical study. Contemp Clin Dent 2016;7:302-6. Jaedicke KM, Preshaw PM, Taylor JJ. Salivary cytokines as biomarkers of periodontal diseases. Periodontol 2000 2016;70:164-83. Raja R, Rajasekar S, Mythili R, Senthil Kumar S, Sethupathi S, Felix JW. Assessment of macrophage inflammatory protein – Iα levels in saliva and gingival crevicular fluid in patients with chronic periodontitis.-original research. J Med Dent Sci Res 2016;3:28-34. Shapira J, Berenstein-Ajzman G, Engelhard D, Cahan S, Kalickman I, Barak V, et al. Cytokine levels in gingival crevicular fluid of erupting primary teeth correlated with systemic disturbances accompanying teething. Pediatr Dent 2003;25:441-8. Wise GE, Que BG, Huang H. Synthesis and secretion of MCP-1 by dental follicle cells – Implications for tooth eruption. J Dent Res 1999;78:1677-81. Ahuja R, Almuzian M, Khan A, Pascovici D, Dalci O, Darendeliler MA, et al. Apreliminary investigation of short-term cytokine expression in gingival crevicular fluid secondary to high-level orthodontic forces and the associated root resorption: Case series analytical study. Prog Orthod 2017;18:23. Ze-Iyamu IN, Umoh AO. Blood pressure, blood sugar and gingival crevicular fluid volume in adult females with malocclusion in Benin city, Nigeria. Port Harcourt Med J 2017;11:72-8. Mutlak Shaimaa S, Hasan Najat A, Al-Hijazi Athraa Y. The profile of tooth and gingival crevicular fluid matrix metalloproteinase-1 in different dental diseases. Int J Med Res Health Sci 2017;6:57-66. Rody WJ Jr. Wijegunasinghe M, Holliday LS, McHugh KP, Wallet SM. Immunoassay analysis of proteins in gingival crevicular fluid samples from resorbing teeth. Angle Orthod 2016;86:187-92. Ureles SD, Chrzan JM, Norton LA, Rossomando EF. A role for TNF in bone resorption of deciduous molars in human beings. Am J Orthod Dentofacial Orthop 2000;118:196-202. Cohen S, Carpenter G. Human epidermal growth factor: Isolation and chemical and biological properties. Proc Natl Acad Sci U S A 1975;72:1317-21. Memarpour M, Soltanimehr E, Eskandeearian T. Signs and symptoms associated with primary tooth eruption: A clinical trial of non-pharmacological remedies. BMC Oral Health 2015;15:88. Cielinski MJ, Jolie M, Wise GE, Marks SC Jr. The contrasting effects of colony-stimulating factor-1 and epidermal growth factor on tooth eruption in the rat. Connect Tissue Res 1995;32:165-9. Kamma J, Mombelli A, Tsinidou K, Vasdekis V, Giannopoulou C. Cytokines in gingival crevicular fluid of adolescents and young adults. Oral Microbiol Immunol 2009;24:7-10. Zhelnine V, Zukow W. Proinflammatory cytokines in patients with obstructed eruption of wisdom teeth. J Health Sci 2014;4l:193-202.